The Internet hype machine is proud to bring you…Stage Fright! A musical slasher! I personally am so in, but it’s generally a risky mashup. How many of us actually like both Glee and gore? Summer camp theater geeks stalked by a masked killer? Awesome. There were some great things about the slasher musical Stage Fright. And then…there were some not so great things. Namely…the music. I am a music whore, but Stage Fright delivers one grating, hook-less song after another. And unfortunately, instead of giving us a pop or rock opera, we get…opera. There are some whimsical show tunes, but a majority of the music is pure Broadway dramatics sung in operatic soprano. It actually drove my hubby out of the room. It’s as brutal as the death scenes. Also, while some of the songs are in context and help tell the story (as they usually do in a musical), a good amount are numbers from the musical that this theater camp is putting on, which basically makes it pointless filler. I guess it’s a smart move to make the songs unpleasant though, because the ear bleeding that results makes it clear why the masked killer wants everyone dead. 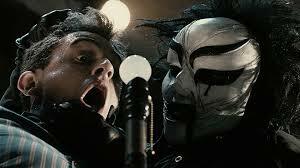 In fact, the killer, wearing an uber-freaky mask, is the voice of hard rock sanity amidst all this awful fluff. 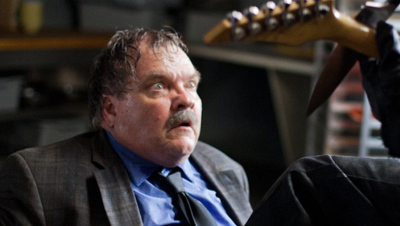 The killer is seen at intervals going mad listening to the monotony, rockin’ out on a guitar, and slashing away at a wall of pictures of the cast, and even gets to perform the best song in the movie—a hard rocker that, appropriately, is performed while Meat Loaf is on the chopping block. Meat doesn’t get to perform any Jim Steinman compositions, but he does sing a couple of cheesy ditties in the movie. Personally, if I were making a slasher musical starring Meat Loaf, my first priority would be to get Jim Steinman as the composer! The Bat Out of Hell 1,2 & sort of 3 writer would have given Stage Fright the dramatic, horrific, hard edge it needs. Of course, it would all depend on whether or not Meat and Jim were on the outs at the moment. 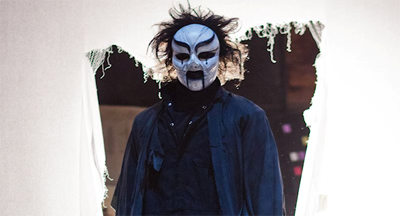 But I really think that in order to grab a slasher audience for a musical, the music has to be as gritty as the horror. My concern about the music began the moment the kids arrive at summer camp and break into a song that should have been as awesome as “Back to School Again” by the Four Tops, which opens Grease 2. Instead, their song in no way grabbed me or got stuck in my head. Okay, not totally true. One section of the song was a winner—two guys singing about the level of their gayness. Indeed, that’s the musical highlight of the film. And this is coming from a guy who lives for Grease 2, The Pirate Movie, and From Justin to Kelly. Okay, so maybe that’s why I think it’s the highlight. Although, I also have to give a nod to the kids/killer mashup—the goody-goody/sleaze combo harkens back to the Olivia/The Tubes duet from Xanadu. But enough about the music. Now onto the horror. For starters, I would have liked to have seen Minnie Driver in the film a bit more. She’s the Drew Barrymore of Stage Fright. The bright side of losing her so soon is that her murder is amazing! Totally vicious and gruesome. So ten years later, her daughter and son work at the summer camp—which is putting on the very show Minnie was starring in when she was murdered! Well, that’s good news! The daughter, who is our main girl, has appeared in the horror flick House at the End of the Street and the hockey musical Score starring Olivia Newton-John, so she’s a perfect candidate for final girl in this film. Naturally, she auditions for the role her mother played. Her biggest competition is none other than the red-headed geek chick from Todd & the Book of Pure Evil. Excellent. After about forty minutes of rehearsals, backstage drama, red herring, and occasional killer POV, we finally get the first kill. And it’s worth the wait. The killer makes a fantastic entrance and the kill is gruesome and violent. After that, we move to the final curtain. Several people are killed in quick succession, some on and some off screen. There’s a gay kiss. There’s a bucket of pig blood (I know, done to death, but there’s a whole new generation that loves the Carrie remake, so it’s all new to them…). The killer starts to deliver one-liners. We get the twist you can see coming from a mile of bad songs away. Then we get a chase scene. And just when the movie has redeemed itself as a horror flick, there’s a cheap “killer smashes through the mirror” scare cliché to conclude the film. But we love it anyway because it’s a total reminder of how, despite sucking as a musical, Stage Fright is a pretty damn good throwback to old school slashers. This entry was posted in Johnny You ARE Queer - Gay Thoughts, Movie Times & Television Schedules - Staying Entertained, Sound Check - The Songs Stuck in My Head, The Evil of the Thriller - Everything Horror and tagged gay horror, horror musicals, slashers, Stage Fright. Bookmark the permalink.